When it comes to swimwear less is more when learning to swim. The popular baggy surfer style board shorts, loose fitting rash guard shirts, and tutu-inspired swimsuits may be fashionable but are NOT functional when it comes to lesson time. Instead, outfit your child in a snug fitting ‘racing style’ swimsuit for lesson time. Anything that is worn in the pool beyond a basic swimsuit gets filled with water, which adds drag and weight that your little one has to overcome. This makes learning-to-swim a much more difficult task. At Old City Swim School we want to remove as many barriers to learning to swim as possible. Learning to float and balance in the water is hard work! The more material your child is wearing, the more waterlogged and weighted down they are. If your child is struggling to pass a given level, or if you’re simply interested in setting your child up to perform at her best, we recommend leaving the rash guard, baggy shorts, and princess-inspired swimwear at home. Snug-fitting one-piece racer back style swimsuit for girls and snug-fitting shorts-style suit for boys that covers the thigh. For swimmers Level 4 and higher, a basic clear swim goggle is needed. (Avoid mask-style goggles and the popular designer goggles that tend to not function as well.) Goggles are optional for swimmers in levels 1 – 3. For anyone with hair long enough to get in their eyes a ponytail is a must and more preferably a swim cap (silicone or latex). Thankfully UV protection from a swim shirt isn’t an issue in our indoor pool facility. Once your child learns our basic swimming survival skills of balance and floating, it’s much easier for your child to adapt those skills while adding in those necessary protective layers for outdoor play and wearing fun, fashion-forward pieces. Hopefully, someday your child will be so good at swimming that in order to help them train effectively, their swim coach will require them to wear leggings and an extra baggy swimsuit at practice. Until then… leave the rash guard shirts, surfer board shorts, and costume-inspired swimsuits at home! For more tips like this check out our FREE download on How to Set up your Child for Success in Swim Lessons! The exact moment your child can demonstrate the necessary skills to advance levels, they will be pulled from their current level and advanced mid-lesson. There are no minimum time requirements in any Level. There are no age requirements for any level. Advancement is 100% solely based on your child’s ability to demonstrate very specific swimming skills. That said, children advance through the Levels at wildly different rates. We don’t advance children based on anything other than demonstrated skills, so as you can imagine, there are a lot of factors that go into how quickly your child will advance through the levels. To break this down and provide you with some level of expectation, we recently reviewed the data for more than one-thousand promotions and found some interesting points to consider while assessing if your child has been in any given level for too long. The most important metric to how quickly your child advances in a given level is: what level, exactly, your child is trying to graduate from. Levels 1-4 are our basic ‘freestyle and survival’ levels. 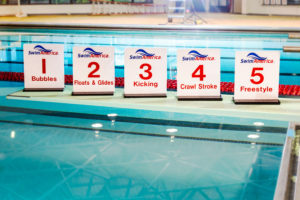 In these levels, children will learn floating, kicking, basic in-water breathing, and how to swim 5 meters without stopping. The most important metric to how quickly someone graduates a level between 1 and 4 is how much water exposure your child has gotten throughout their life, followed very closely by age. While swimming lessons certainly accelerate the speed in which your child learns swimming, general exposure to the water for play and fun is vitally important to a young swimmer’s development. Exposure to the water reduces the fear a lot of children have with water, it ignites your child’s subconscious learning patterns, and it makes swimming something your child sees as ‘fun’ and not as a chore. Age is also significantly important. Older kids tend to be less afraid of the water and therefore are more willing to challenge themselves during the lesson. Older kids tend to be able to listen and follow directions better, and older kids tend to have more exposure to the water. These advanced skills take children of all ages much more time to acquire than the previous levels. The skills we teach are significantly more refined and we start to look more at style and technique than in previous levels. These advanced levels are where we transform your kid from someone who’s fairly safe in the water into a child that can confidently dive into any water situation with your full confidence of their safety. Your child will also have the foundational skills to walk onto any competitive swim team if their passion for swimming grows into a desire for competition. As always, if you feel like your child has been stalled at a certain level and aren’t sure why, please let someone from the Old City Swim School staff know and we’ll happily give you an update with what your child is currently working on and what they need to improve to advance to the next level. The bottom line is that we are teaching a life-long skill and it takes time to learn! Our recommendation is to enroll your child and bring them every week as consistently and for as long a period of time as possible. Regardless of what level or how quickly your child advances through the program, consistent weekly practice drives increased water confidence which creates the best environment for learning. We want your child to enjoy lessons, have fun and with that in place, the skill development will come!